In the fall, when the first cold front blows in from the west, locals head to supermarkets to shop for gumbo ingredients. Chickens and sausages become difficult to find south of the I-10 corridor and French bread and bags of rice fly off the supermarket shelves. Though I am usually part of the crush of shoppers, I also load up on the makings for soups to simmer when my kitchen windows frost rain beats down on the tin roof of my home. My father’s cast-iron Dutch oven, well oiled and wrapped in old newspapers, is liberated from the deep, dark corner of my pantry. An old, beat up soup pot, inherited from Tante May, is recovered from the shelf in the utility room. Oh, if those pots could talk! During the early morning breakfasts of my childhood, Mama and Papa often discussed the possibilities of soup suppers served at the big cypress table in the kitchen. 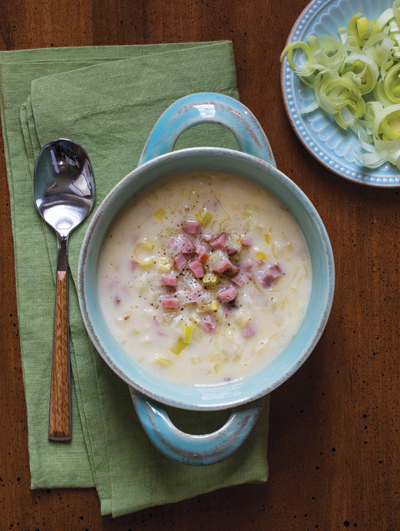 Creamy, thick white bean soup was Papa’s all-time favorite. My sister and I preferred vegetable soup, jam packed with cabbage, potatoes, turnips, tomatoes and chunks of tender beef. My brothers opted for split pea or onion soup topped with layer of melted cheese. On Sunday nights, we often had oyster soup, a specialty of my paternal grandmother. Sometimes it was made with lots of oyster liquor, other times it was made richer by the addition of milk or cream. Just before serving, Mama added big chips of butter to the pot to make it even more special. In other parts of the country, chicken soup aids in treating the common cold, Mama’s remedy was corn soup she made with shaved corncobs during the summer and put up in the freezer. As I grew older, I came to love a great repertoire of more sophisticated potages. Visits to New Orleans always included a stop at Antoine’s for dark and pungent turtle soup. Later I became enamored with artichoke and oyster soup at Masson’s near the lakefront. For lunch on cold days, I love nothing better than a sandwich paired with a cup of soup. A bowl of creamy red bean soup accompanied by a warm ham sandwich slathered with Creole mustard is a winner in my book. Then again, another favorite is hot beef consommé paired with slices of smoked turkey tucked in between two slices of French bread dressed with roasted peppers, cream cheese and red onions. My friend says there’s nothing better than bacon, lettuce and tomato soup, coupled with pimento cheese on toast. Soup is usually easy to prepare and needs only a salad, along with crackers, bread, muffins, cornbread or biscuits and maybe a dessert to complete it. Make a large quantity so some can be stored in the freezer, ready to pull out when the cold wind blows. Make vegetable soup your own by adding your favorite vegetables. When adding beef, check with your butcher for what is sometimes labeled soup or stew meat. Sometimes I use cubes of brisket or round steak. Beef bones can be cooked in the pot with the vegetables to give it a heartier flavor. Just remember to remove them before serving. In a large saucepan over medium heat melt butter and add flour. Whisk until the mixture is smooth and thick, about 2 minutes. Add leeks and tasso, stirring often for 3 minutes. Slowly pour in the stock and whisk. Simmer for 10 minutes. Add cream and simmer for 5 minutes. Season to taste with salt, pepper and Tabasco. Serve warm in soup bowls. Put the soup meat in a large, heavy pot with salt, black pepper, cayenne, basil, bay leaves, and broth. Bring to a boil, then reduce heat to medium-low and simmer for about one hour, or until the meat becomes tender. Add vegetables and simmer for about 1½ hours, stirring occasionally. If the broth reduces too much, add more broth or water. Add the vermicelli and cook just until tender. Remove bay leaves and skim off any fat that has risen to the surface. Heat the oil in a large, heavy pot over medium heat. Add the onions, celery, salt meat or ham, sausage and bacon, if using, and cook, stirring, for about five minutes, or until the onions are soft and golden. Add beans, water or chicken broth, and tomatoes. Stir to blend. Bring to a boil, then reduce heat to medium-low and simmer, uncovered, for about 30 minutes, stirring occasionally. Season to taste with salt, black pepper and cayenne, pepper but be aware that the salt meat, sausage, bacon and tomatoes are salty and peppery. Skim off any oil that has risen to the surface then serve hot. Bring all the ingredients, except the sherry, to a boil in a large soup pot. Then reduce to medium-low and simmer for about 2 hours, or until the peas are tender and the mixture is thick and creamy, stirring occasionally. Add the sherry and cook for 15 minutes. Adjust seasonings if necessary. Remove the bay leaves before serving. Combine the oil and flour in a large, heavy pot over medium heat. Stirring constantly, making a light brown roux. Add the onions and cook, stirring often, for about five minutes, or until the onions are soft. Strain the oysters and reserve the liquor. Set the oysters aside. Combine the liquor and water, and add this to the roux mixture, whisking to blend well. When the mixture comes to a boil, reduce heat to medium-low and simmer for about 10 minutes. Add oysters, butter and parsley. Cook for two to three minutes or until the edges of oysters curl. Season with salt and cayenne. Remove from heat and serve warm.